I injured a tooth years ago and now my dentist says it needs to be removed. She said, “It's a simple extraction,” but is referring me to an oral surgeon. Does this sound simple to you? It sounds like there may be a difference in perception of the word, “simple.” From the dentist's perspective, this probably implies a routine extraction. To you, the patient, it may well be a totally new experience, so it's a reasonable question. The ease or difficulty of tooth removal is related to the size, length and the number of the roots as well as the location of the tooth in the mouth. This picture is for illustrative purposes only and not meant as an exhaustive guide. Removing teeth, while not a particularly pleasant experience, is a routine and uncomplicated procedure in the hands of an expert. And for most oral surgeons it is a mainstay of oral surgical practice. What keeps a tooth in place in its native bone is a membrane or ligament that surrounds the tooth root called the periodontal ligament (“peri” – around; “odont” – root). The main fibers of the ligament surround the tooth at a slanted angle similar to a hammock and attach it to the bone. By carefully manipulating the tooth, these fibers can be fairly easily dislodged, allowing the tooth to be removed quite simply. Believe it or not, there is a real art and “feel” involved in tooth removal, making it both uncomplicated and relatively simple. It is certainly easier in experienced hands and therefore inconsequential for a patient on the receiving end. To ensure the extraction is “simple” in the professional sense, involves proper assessment and diagnosis beforehand, in particular of the shape and status of the tooth or teeth to be removed, and the surrounding bone in which they are encased. 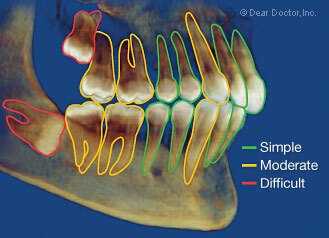 Routine radiographic (x-ray) examination will allow that determination. In addition the oral surgeon will also take a thorough medical and drug history, to both ensure that you are healthy enough to undergo this minor surgery, and that you have normal blood clotting and wound healing mechanisms. A simple extraction refers to removing a tooth in which the shape of the root or roots lends to easy removal. It may also be likely that the surgeon will fill the socket (the space formerly occupied by the tooth), with a bone substitute or other grafting material if it is necessary. Most grafting materials today act as scaffolds upon which your body builds or replaces the grafting material with bone. This ensures that any existing boney defect is reconstructed and the original bone mass or volume is reestablished. This is particularly necessary if a dental implant is contemplated to replace the tooth root. However, your oral surgeon should let you know whether or not your socket(s) will require grafting prior to your treatment. Another important factor in making an extraction procedure “simple” is recognizing what to do if there are any minor complications. For example, if a tooth root is brittle it may fracture due to previous trauma and/or a root canal treatment. This may require some surrounding bone removal to access and remove the fractured root fragments. While this complication may sound dramatic, it is not—and is routinely encountered and planned for by an experienced oral surgeon. Immediately after tooth removal it is normal to place sterile gauze over the socket for 10-20 minutes with gentle pressure to control bleeding while a clot forms. Some small sutures (stitches) may also be placed over the socket to help control bleeding. As for your after surgery care, you will receive instructions for cleaning and caring for the extraction site. You may also be provided with any or all of the following: antibiotics, anti-inflammatory (swelling control) and analgesic (pain control) medication, usually of the aspirin/ibuprofen family of drugs as well as saline or antibacterial mouthrinses. Tooth extraction is usually carried out with local anesthesia, numbing the teeth to be removed together with the surrounding bone and gum tissues. In addition oral sedation medication, nitrous oxide and/or conscious sedation can be used to render the experience anxiety free, relaxing and amnesic (“a” – without; “mnesia” – memory). This is usually required for more complicated or multiple tooth extraction. By the time the sedation medication has worn off you won't even know it has been done. It is important that all the potential risks, benefits and possible outcomes of tooth removal are reviewed with you beforehand, so you know what to expect. We hope that this puts your mind at ease and addresses your question.